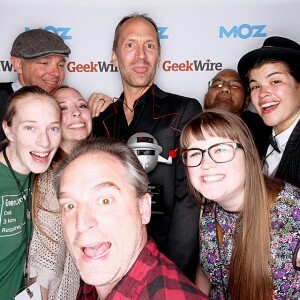 Brown Paper Tickets won the 2015 GeekWire Awards’ Bootstrapper of the Year. Quite an honor for a company celebrating its 15th anniversary using corporate social responsibility vs. venture capital as a propelling business backbone. Thank you to all who voted for us. GeekWire reported that 25,000 votes were cast among numerous categories and finalists and we’re honored to be recognized from the tech community, our customers and the public for succeeding without a dime of VC money. We value every employee, event organizer and event attendee in our local and global community. William Scott Jordan, founder, president and CTO, says, “Bootstrapping the company has made us more nimble, efficient and sustainable and we are able to pay that forward. We have better planning and more scalability at a lower cost than the rest of the industry.” Here’s more bootstrapping insight from Brown Paper Tickets’ founder. Steve Butcher, CEO of Brown Paper Tickets, believes in giving more and taking less and invented the not-just-for-profit business model that’s reflected in actions such as 40 hours per year per employee of paid time to volunteer in communities. This company benefit earned us a finalist nomination for GeekWire Awards’ Perk of the Year in 2014. Fantastic news. GeekWire, the national technology news site nominated Brown Paper Tickets for Bootstrapper of the Year. Vote for us now or read on and find out what makes us viable bootstrappers. 1. After launching the world’s first free ticketing and event registration service, Brown Paper Tickets has remained profitable and continues to hit record sales year after year. We’ve created a multi-billion dollar business niche in the ticketing industry, without a dime of venture capital. 2. Brown Paper Tickets donates 5% of its profits from every ticket sold to good causes chosen by ticket buyers, so each event we ticket has a social impact. 3. In 2014, Brown Paper Tickets started a revolution by offering event organizers the ability to collect online donations without taking service fees. Part of our not-just-for-profit business values. William S. Jordan (@wsjordan), Brown Paper Tickets’ founder, president and CTO shared insights into why he and his business partner and CEO Steve Butcher continue to turn away VC funding. Q: You’ve been offered VC funding many times. Why haven’t you accepted it? Jordan: We love live events. 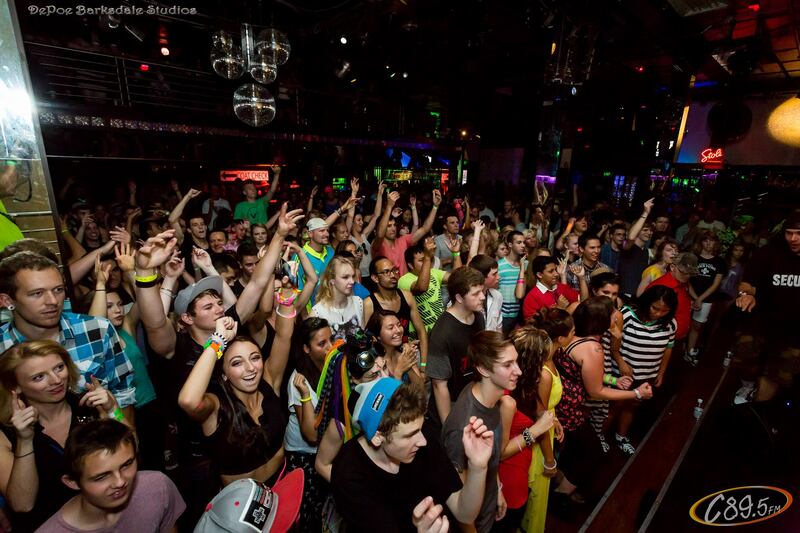 We provide everything event organizers need to make their events more successful. Other ticketing companies aren’t providing the features and services we offer because it doesn’t maximize their profits. Investors would force us to do what was necessary to make the most profit. We love creating technology and solutions that elevate the success of event organizers and experience of ticket buyers. Jordan: Without having to be beholden to investors, we’ve been able to offer live 24/7 customer service. We’ve given 5% to charity with every ticket sold, so that all the events on our site have a social impact. We’ve created deeper, more authentic relationships and saved the day for people who needed our help. We’ve given the world’s first free access to advanced event ticketing features such as assigned seating, something that’s taken the rest of our industry 12 years. We innovated new technologies such as our Transfer-to-a-Friend™ feature that allows ticket buyers to text tickets to their friends. Because we don’t care about making the highest profit, other companies are now being forced to offer the services and technology that we offered at the lowest prices possible, just to keep up. We don’t nickel-and-dime event organizers or ticket buyers for mailing tickets, accepting donations online, or sending staff to help them to run their box office. We treat event organizers as friends, sharing technology, services and assistance at the lowest service fee possible. We make choosing Brown Paper Tickets a no-brainer, and by doing so, we help the entire live events industry. Q: What’s in it for Brown Paper Tickets? Jordan: Bootstrapping the company has made us more nimble, efficient and sustainable and we are able to pay that forward. We have better planning and more scalability at a lower cost than the rest of the industry. We have had to work harder, but we have more intimacy with the product and industries, making it easier to see trends, anticipate needs, avoid unnecessary costs and create solutions without approval from a board of directors. All of this makes us great problem-solvers and gives us the ability to share better counsel and to help anyone who works with us make more money from their events. When you succeed, we succeed. Q: Any down side to bootstrapping your company? Jordan: Whenever there is a problem, we don’t have the luxury to throw money at it. We are forced to look at issues differently and sometimes work a lot harder than a team working at a VC-funded company, awash in cash. Also, most companies get a lot of press for partnering with big corporate money. But bootstrapping is a mindset that also makes one more resilient and creates a fight-to-win attitude that resonates with a lot of independent event organizers. So, it’s still an asset. Q: As the company grows, how can it remain an underdog to VC-funded competitors? Jordan: When a scrappy start-up creates a product or service that fixes problems and exceeds the standards for performance, service and price offered by big-money corporations, it changes everything – and that start-up becomes the underdog. You’re not the one that’s supposed to win; and people love it when you do. Underdogs are in a position of power because people are rooting for you. If you use your success to fund your next great idea, your tribe will be rooting for you because you are making interesting things happen. I want to see how far we can take it. 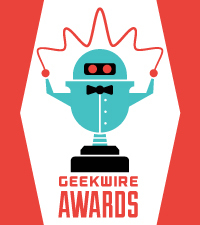 Brown Paper Tickets was a 2014 finalist for GeekWire’s Perk of the Year. Read all about it. Social media continues to evolve and morph into our daily lives personally and professionally. Real-time sharing of photos, updates (tweets, posts, etc.) happen at all types of events. Here’s to using social media more strategically before, during and after events. The visual revolution is driven by mobile smart phones and social media channels such as Pinterest and Instagram. They’ve turned browsing the web into a visual experience unlike any we’ve seen in web history. Photography and graphics drive engagement in these channels (and others). Twitter also allows photos to be added to posts and stats show tweets with photos often yield higher engagement than those without. People love sharing selfies while they attend theater shows, parties, festivals or are exploring town. Instagram, like Facebook and Twitter before it, is now a must use social channel. Facebook, Twitter and LinkedIn all now show preferences for videos uploaded and hosted on their platforms, cutting into YouTube’s market share of video engagement and views. Facebook recently surpassed YouTube for most video views on desktops, according to comScore in 2014. You don’t have to be a pro to shoot or publish video now. Use your smart phone, select apps and simply share what’s happening at your shop, in your local area and with your products. Polished videos are less necessary with the rise of social video sharing tools such as Vine, Instagram’s video tool and smart phone capabilities. Authentic interviews, previews of products, welcoming words from entrepreneurs, backstage clips. Content is ready for filming and an increasing number of social site welcome it. Ask a vlogger how important video is. Content is king and SlideShare makes sharing content easier than ever, especially for businesses who service other businesses and don’t necessarily have loads of consumer-rich, delicious photos. Think of it as a simplified PowerPoint tool. Use SlideShare to distill benefits of using your service or company and allow your sales crew to share the presentation online, via email or even use for presentations. Since SlideShare is owned by LinkedIn, which has made major strides to ramp up content publishing for all, new features and functionality have made SlideShare a necessary part of business marketing, thought leadership and relevancy. Hashtags are officially ubiquitous sliced and diced methods of searching and finding across all social media platforms (except LinkedIn, bless its heart). They’ve become the norm (thanks to Twitter for introducing us to these utilitarian beauties). Use too general of a hashtag and you’ll lose your audience. Instead, focus on highly targeted, localized or temporary hashtags that a niche tribe cares about and focus a conversation around relevant topics. Forget #food #socialmedia #events. I attended Seattle Interactive Conference and they annually use #sic2014 (etc) so attendees can hone in and join conversations or follow threads more easily. Host an annual festival or conference? Use an acronym or abbreviation and possibly the year. BottleRock Napa Valley could use #bottlerock15 this year. Want to search hashtags across all social platforms? Use a hashtag aggregator like Tagboard. Yes, Facebook mucked with their algorithm much to the chagrin of marketers, small businesses and nonprofits. Gone are the days of your post reaching 50% of your fans instantly. Now you have to work for it. Or pay for it. Facebook, after going public, monetized their news feed incrementally. Luckily, a little money goes a long way. Test boosting posts, one of the most cost-effective paid placements available. Write a post, include an eye-catching photo and promote it to your followers and their friends. Then do another post and target new users by geography, age and interest(s) and see which attracts most engagement, views or drives traffic to your site. I’d recommend setting aside $20/month to boost select content. You basically have to pay to play more and more. Other social channels are following suit and offer options to pay to expand reach of your content or offer. What other trends or tactics are you planning to tap or try in 2015? Tags: event planning, Social Media. Got a big heart? You’ll love this. 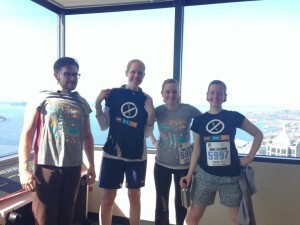 Ready, set, raise more money. With our fee-free online donation tool, you can maximize money for good causes, projects and organizations with no service fee taken from Brown Paper Tickets. Zero. Zilch. Nada. No contract. No deadlines. No limitations. No charge from us. $667,047 has been raised to date by more than 1,000 community centers, non-profits and individuals using our fee-free tool for online fundraising. 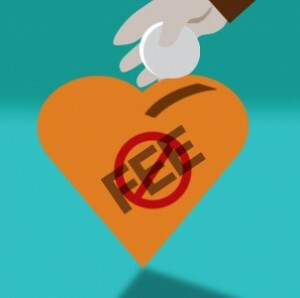 Donor money goes to a heart-felt cause instead of a ticketing company, donation tool or crowd-funding platform. Prepare for Giving Tuesday. Use our tutorial. Add your own credit card processor. (Due to an agreement with our bank, the Brown Paper Tickets processor cannot accept charitable donations). Create an event and add donation pricing. Then promote the page and watch the goodwill grow. $44,000 was the record raised from one single Brown Paper Tickets donation-only event page using the fee-free donation tool to buy clothes, food, blankets and other items for Brooklyn shelters after Hurricane Sandy. A current fundraising page is for Feather Note Music Project, a philanthropic program to prevent suicide in Native American youth by teaching and giving them tools to record music, stories and languages of their culture. You can also organize a charity event, fundraiser, or benefit and allow event attendees to contribute donations when they purchase tickets. Ticket buyers will still be charged $0.99 plus 3.5% of the face value, but when you use your own processor Brown Paper Tickets will only take $0.99 + 1%, leaving you with 2.5% to help offset your processing fee. No fee is added to donation levels, only to tickets. Official 501©(3) organizations that qualify for a lower credit card processing rate with PayPal or their credit card merchant find that Brown Paper Tickets’ gift of an additional 2.5 percent of the face value of every ticket often covers 100 percent of their PayPal or credit card merchant fees. A benefit music concert featuring band Rusted Root worked well for Heather Rangel, San Francisco Bay Area event organizer of a $100,000 fundraiser benefiting CancerCommons. Supporters bought tickets, donated funds or both in the same transaction. “I couldn’t believe that Brown Paper Tickets would do this for us for no fees; it felt like there must be a catch, but there never was one,” Rangel said. 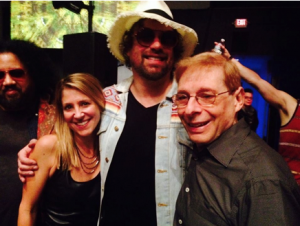 Rangel’s fundraising event was held in tribute to a friend who lost her battle with cancer in fall 2014. CancerCommons, a nonprofit that educates patients and doctors about cutting-edge treatments and research, received all funds directly. Rangel was so pleased with her event success, she just created a new $1 million fundraising campaign. Tags: charity, crowdfunding, events, fundraisers, givingtuesday, philanthropy. The Internet has always been a level landscape where anyone could open up a shop, share ideas, spur innovation. That freedom is possible with Net Neutrality. Open, awesome, for-anybody Internet. If you haven’t heard, Net Neutrality is under threat. 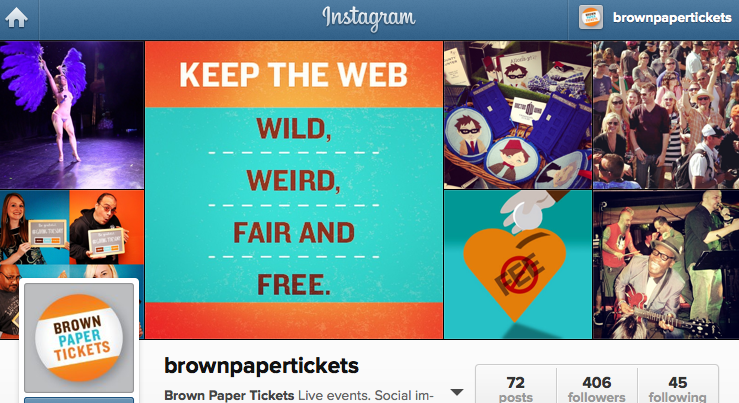 Brown Paper Tickets supports equal world wide web access as an essential right. US Federal Communications Commission (FCC) Chairman Tom Wheeler proposed regulations that would allow big cable companies and telecom to employ Internet fast lanes with extra fees. What does that mean? Sites would slow. Small service providers and business owners would be left in the dust. It’s not only a competitive disadvantage, it’s a free speech issue as it provides an opportunity for big companies to discriminate against online content and applications. You might already know us as Not-Just-For-Profit, free thinkers of the ticketing world. We serve millions of ticket buyers, thousands of event producers. Artists. Musicians. People who are shaking things up, serving the community. Garden party, heavy metal show, big stage or intimate venue, it’s 100% free to ticket your vision with us. We stand with millions of others out there fighting to keep the Internet wild, weird, wonderful and free. Comments to the FCC will close the end of the day on September 15. Want to keep Net Neutrality? Now is the time to make your voice heard or join the Battle for the Net. Blood. Skates. Cookies. Community. Lives. 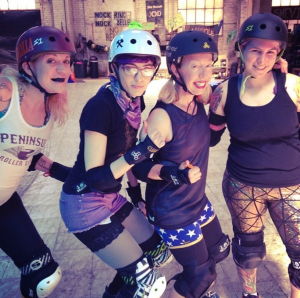 Brown Paper Tickets and Red Cross team up with 8 roller derby leagues in the greater San Francisco Bay Area for the 2nd annual blood drive to save lives, rally the community and make it fun to tap your veins. Dates span August 9 to October 18, 2014. In its first year, “Make ‘em Bleed” 2013 roller derby blood drives attracted record crowds (more than any other non-derby blood drive) and enough donations to save 660 lives. This year, local roller derby athletes will offer autographs, photo opportunities, T-shirts, roller skate cookies, buttons and temporary tattoos to anyone who donates blood. “Donating blood is a generous and selfless act, so by making it fun, we hope more people will come out to donate,” says Silver Foxxy, PR manager for B.ay A.rea D.erby Girls. Join the Undead Bettys from 10 a.m. to 4 p.m. at the Red Cross Bus parked at the Antioch Sports Center, 1210 Sunset Dr.
Join the Quad City Derby Bombshells from 1-7 p.m. at the Asbury United Methodist Church, 4743 East Ave.
Join the Peninsula Roller Girls from 10 a.m. to 4 p.m. at the Red Cross Bus parked at the Redwood Roller Rink, 1303 Main St.
Join the Santa Cruz Derby Girls from 10 a.m. to 4 p.m. at the Red Cross Bus in the parking lot at Whole Foods, 911 Soquel Ave.
Join the Silicon Valley Roller Girls from 9 a.m. to 3 p.m. at Campbell United Methodist Church 1675 Winchester Blvd. Join the Faultline Derby Devilz from 10 a.m. to 3 p.m. at the Red Cross Bus parked at 580 Tres Pinos Rd. Join the B.ay A.rea D.erby Girls from 10 a.m. to 4 p.m. at the Zion Lutheran Church, 495 9th Ave.
Join Sonoma County Roller Derby and Resurrection Derby Girls from 11 a.m. to 5 p.m. at the Red Cross Bus parked in front of Cal Skate, 6100 Commerce Blvd. Seattle radio station C89.5 FM (KNHC) just wrapped up their annual pledge drive. A supporter of community-run arts organizations, Brown Paper Tickets has donated to Seattle Public Schools-owned C89.5 FM over the years, including $1,000 in 2014 to match listener contributions. 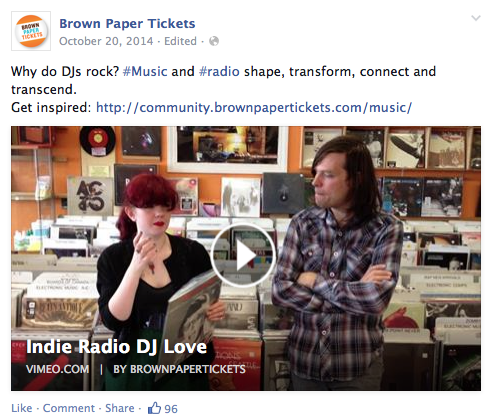 Why does Brown Paper Tickets support kid-powered radio? C89.5 FM is a student-run radio station that gives high school teens an opportunity to explore technology, production, creativity, music, community and event organizing. With arts education funding trickling down to the bare bones around the US, a creative outlet for students that may not otherwise be available seemed a worthy cause. In following with Brown Paper Tickets’ low-power FM radio project (spearheaded by Sabrina Roach, our Public Media Doer), KNHC stresses the importance and value of broadcast as a community connector. KNHC also boasts a worldwide listenership via their online audio stream, and has received accolades as far reaching as Rolling Stone magazine and Billboard’s Top 40 of Top 40. Also, while a public Seattle-based radio station, New York’s Village Voice once hailed them Best High School Radio Station in New York (thanks to their web audio stream). Music. Education. Nonprofits. Community. We support them all—especially when their stars align. What do kids, farms and the Big Apple have in common? You. From May 1 through June 30, 5 cents per New York City event ticket sold will be donated by Brown Paper Tickets to New York-based City Growers. This nonprofit, sprung from Brooklyn Grange (a rooftop farm and green roofing company), educates kids from schools in all 5 boroughs about nature’s nourishment. 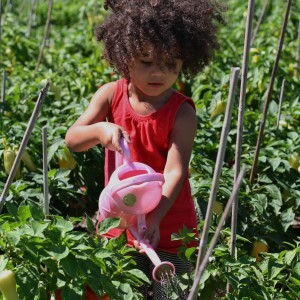 Our goal: Fund at least one City Growers urban farming class for kids. Children, teens, teachers and parents all learn urban farming techniques, pluck produce, touch worms and connect with the environment in other hands-on ways. Since its founding in 2011, City Growers has brought more than 10,000 kids of all ages to their rooftop farms for educational excursions and workshops to learn about earth science, nutrition and sustainability—and get in touch with local food supply roots. Brown Paper Tickets is the only Not-Just-For-Profit event registration and ticketing company and takes community service to heart. We give back to local areas we serve and are proud to support City Growers. Our local New York City event staff has worked with Brooklyn Grange to ticket their growing array of events—workshops, farm tours, yoga classes, dinner parties, weddings, corporate retreats—at their rooftop farms in Queens and Brooklyn (both venues where City Growers holds programs). We’re also opening a New York City office this summer in Long Island City (same neighborhood as City Growers). Support kids’ nutrition, food and environmental education. Buy tickets via Brown Paper Tickets to any New York City event during May and June (May 1 – June 30, 2014) and we’ll donate part of our profits to City Growers. Events must be in New York City limits (including all 5 boroughs). In early July, we’ll report back on results. Ping pong. Dogs at offices. Free food. Tech company perks cause much ado among recruiters, job-seekers and employees. 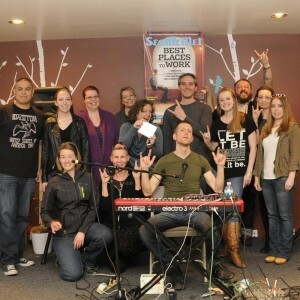 Brown Paper Tickets has many perks, but one that’s truly unique: paid volunteer time of 40 hours yearly for all employees. 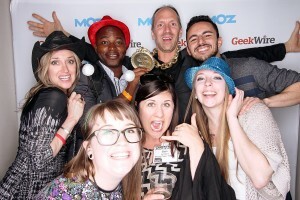 That’s the perk that captured the attention of Pacific Northwest digerati at GeekWire. We’re honored to be 1 of 5 finalists for their 2014 GeekWire Awards in the category of Perk of the Year. Now it’s up to you (our loyal supporters and fans). Vote for Brown Paper Tickets to win Perk of the Year award. Brown Paper Tickets, the Not-Just-For-Profit ticketing and event registration company offers paid volunteer time on, an annual 40-hour work week for social good. All 85 employees (including part-time workers) can volunteer for local nonprofits or improve communities for 40 hours every year. No wait period to use the paid time on. How Do Staffers Use This Perk? Shipping furniture and clothes to an African village, sorting produce and edibles at food banks, building homes via Habitat for Humanity, working phones at KEXP fund drives, teaching gifted children, consoling death-row inmates and many more community-building activities. Employees get to choose which charity or community service they support. Other perks: 6-week paid time off (for vacations, holidays, sick time), dogs at work, free food (sandwiches, salads, coffee, pastries, bagels, fruit and produce for juicing at the office), 100% paid health insurance premium for full-time employees, 90% paid premium for dependents. 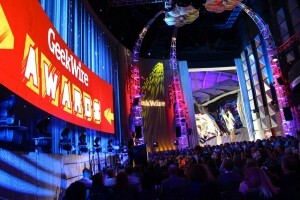 Vote for Brown Paper Tickets to win the Perk of the Year GeekWire Award. Thanks for supporting our socially responsible, community-focused company. Tags: award, community engagement, corporate social responsibility, notjust4profit. Instagram first exploded onto the digital scene as an iOS-only mobile app. Now it’s a massive social network with a web presence. Averaging 150 million active users, and more than 75 million daily users, it’s no surprise that organizations are searching for ways to implement strategic Instagram campaigns. As a brand, your efforts on Instagram, or any social media platform, should be tailored to your specific goals and audiences. We’ve gathered a few of our favorite tips to make sure your presence on Instagram is worthwhile and helps you sell more tickets. Instagram has the potential to take bland mobile photographs and transform them into beautiful art. Lighting, angles and filters are all things to account for as you snap your photographs. Natural lighting works well. Think about which filters would look best in which environments and pay attention to creative ways to showcase products and services. See tips on how to master the art of phone photography. It’s always tricky to test out what time to post your content. Luckily, tons of people have researched when people are most likely to engage with brands. According to TrackMaven, most successful brands on Instagram post their content on Thursdays. Because the application is inherently accessible 24/7, though, the most likely that a user will engage with you and your photo/video is Sunday. The time of day depends on your audience. Tip: Limit your visual content to 1 or 2 posts a week. If you want to document an event with several images, live tweeting is a more effective method for not bombarding user timelines and being able to have a 2-way stream of communication. If your account has 200 photographs and 10 followers, rethink your frequency and photo content. While there is much debate on the use of hashtags for Facebook , the use of purposeful hashtags increases your engagement significantly. While there is no golden number, data shows that accounts with more than 1,000 followers received an average of 21.21 interactions per post while accounts with less than 1,000 followers who included 11 hashtags with their post received an average of 77.61 interactions (according to BufferApp). We don’t encouraging going on a hashtag binge. Use a few targeted, relevant hashtags to boost discoverability and engagement. Cultivating an organic, bot-free following can be tough, but doable. Facebook is one of the oldest social media platforms and likely where brands have their most loyal following. Instagram and Facebook are seamlessly integrated social media sites. Connect your accounts and share content across both platforms. Hashtags will transfer over to enhance your visibility on Facebook’s graphic search and fans that engage with you on Facebook will be alerted of your account and activity on Instagram. Tip: Hosting photo contests on Instagram through Facebook has proved successful for many organizations. You can organize submissions through custom hashtags. Facebook has strict rules on hosting contests on their platform. Directing the interactions to Instagram through Facebook is an easy work-around. The world is your visual oyster. We know you’ll be able to take the world by storm through Instagram. 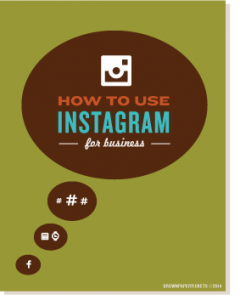 You can reference our simple Instagram Guide here for extra help. If you have any questions or concerns about getting started always feel free to shoot us an email at Promo@BrownPaperTickets.com or call (800) 838-3006 ext. 5.